Last week I wrote a blog post on 20 easy 5-minute self-care ideas for parents. 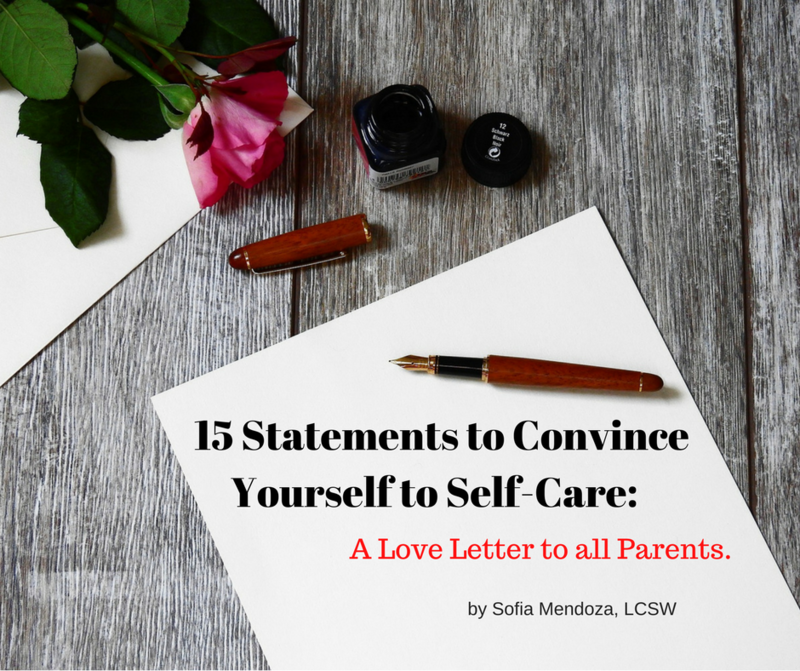 Today, I continue the conversation in the guest post, “15 Statements to Convince Yourself to Self-Care: A love letter to all Parents” on The Productive Parent website. I provide 15 statements and quotes that parents can say to themselves when our guilt, shame or other unpleasant emotions get in the way of taking care for ourselves. I practice saying those statements to myself on a daily basis when I notice feeling overwhelmed and just not feeling well as I attempt to juggle all my roles. Many parents are notorious for putting their needs last, and these 15 statements help to remind us of focusing on our well-being for our children and to model self-care for them too. Since I don’t want to mislead you, I’ll continue the list and add 16 – 30 self-care quotes here. 16. You can’t collect water from an empty well. 17. Self-care allows me to reduce my stress little by little. 18. Self-care will help me calm down. 19. I make the wisest decisions when I’m calm. 20. A car stops running when it’s out of gas. 21. If I don’t take care of myself now, I run the risk of becoming sick later. 22. My children need to see me being good to myself. 24. I deserve care and compassion, just like my children do. I’m curious to know, what are your favorite self-care quotes? I’d love to make a list of 100 self-care statements for everyone to reference.